Sold as a set of 4 favor baskets. 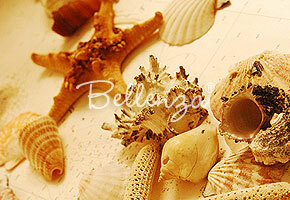 Made from delicate capiz shells with a translucent finish. The shells alternate colors of soft pink and pearl white. Measures approximately 3" high (including handle), with a 3" opening. 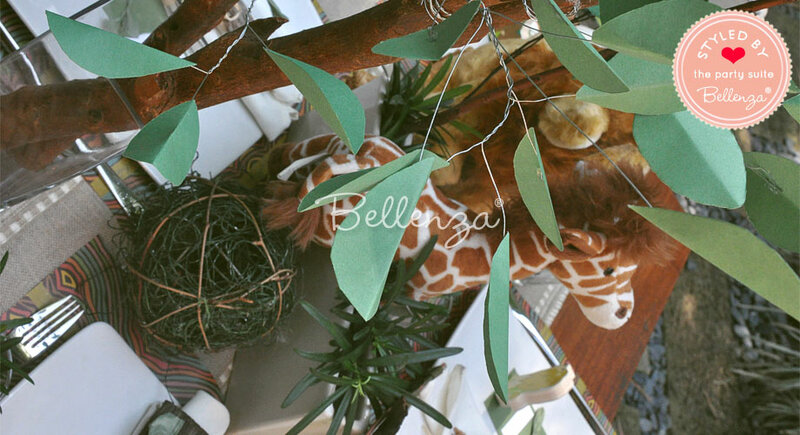 Handle is of gold-tone metal wire with a braided design. 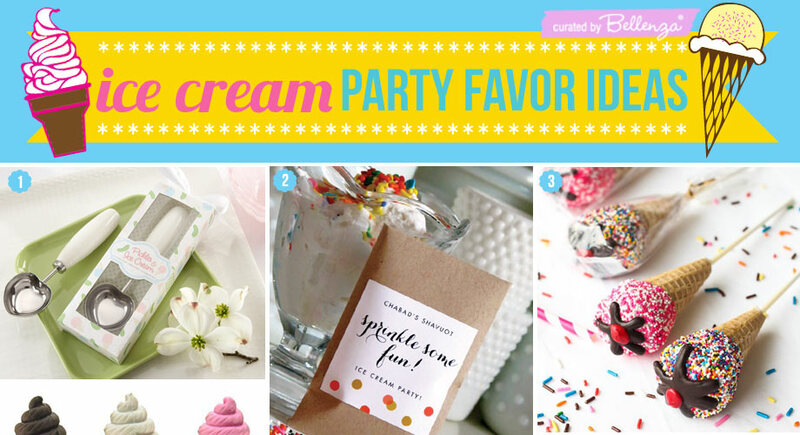 Popular for Easter, preppy-themed shower , or a tea party. 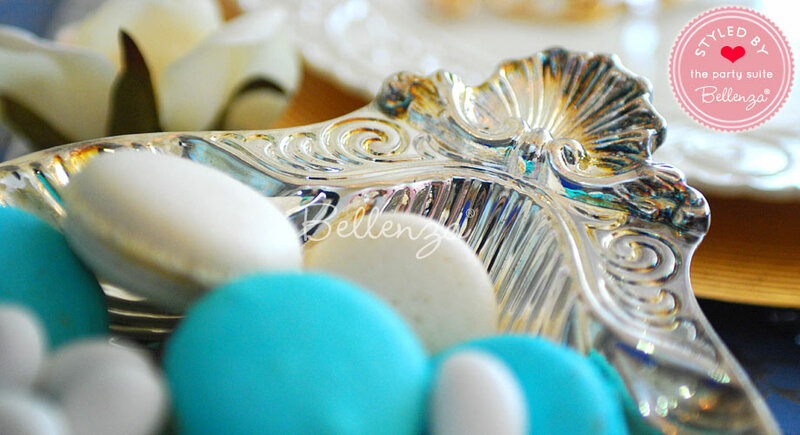 View more seashell party favor ideas. 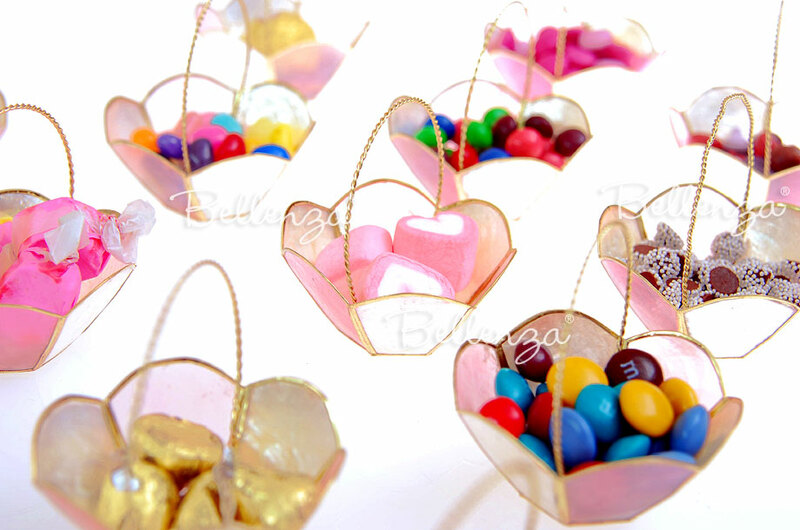 Each basket can fit approximately a handful of candies like pastel mints, M&Ms®, jelly beans, Jordan almonds, mini marshmallows, and gumdrops. 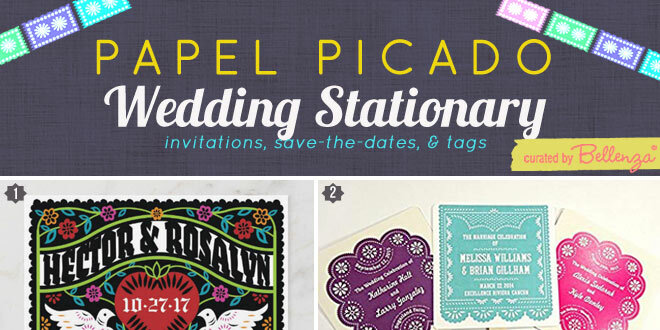 For an Easter season wedding, call to mind all those fond childhood memories of spring sunshine, flower-filled gardens, and Easter egg hunts! Use our capiz shell baskets to mimic the look of traditional Easter baskets but with a stylish flair. 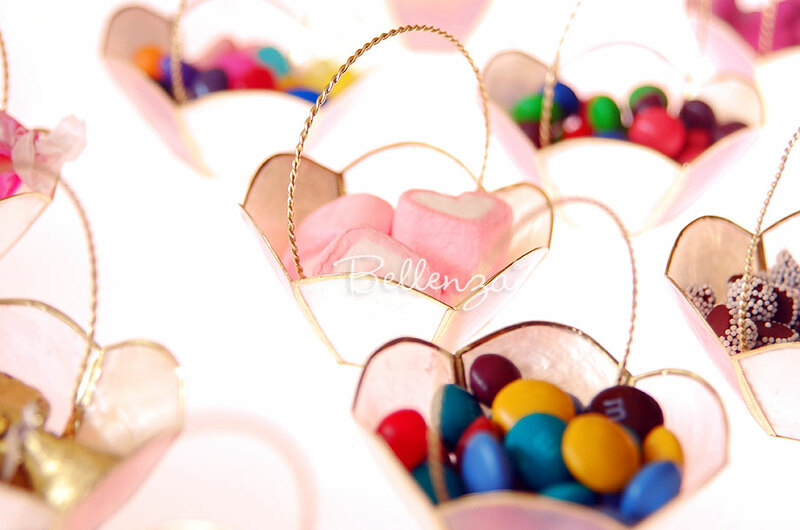 Fill them with pastel-colored bonbons, gumdrops, or mini marshmallows, and finish each one with a crisp white bow. If you could capture spring in a basket, this would be it! 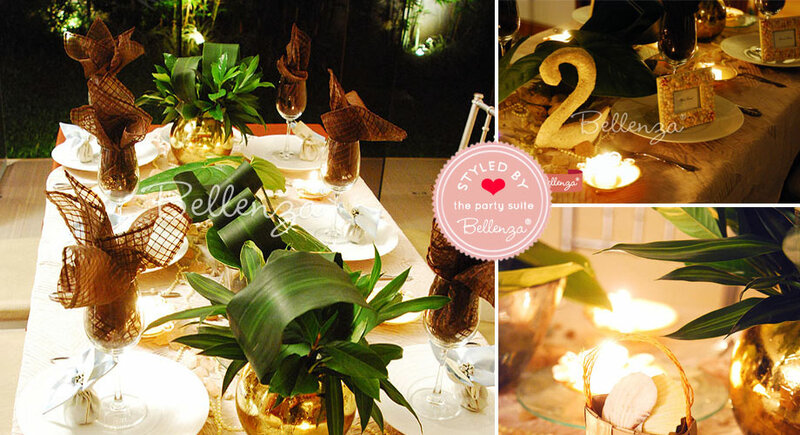 Our capiz baskets make lovely favors at any wedding event. 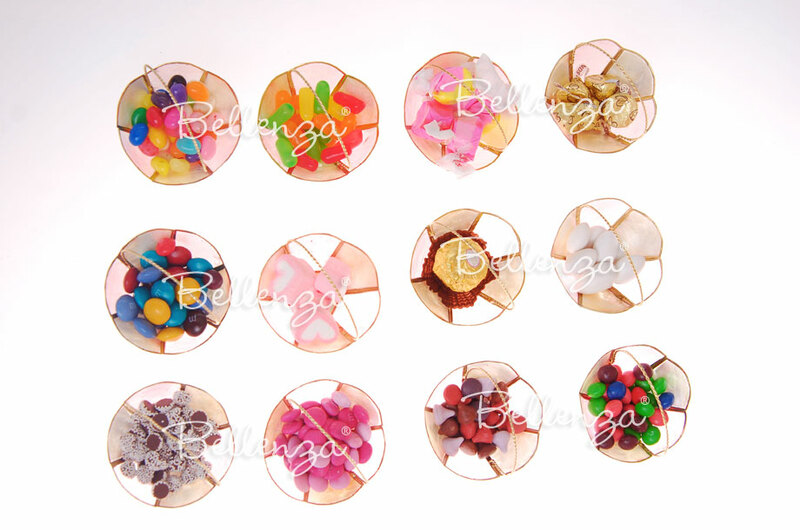 Simply add fillings that suit your party motif, and set them out in the most eye-catching way possible. 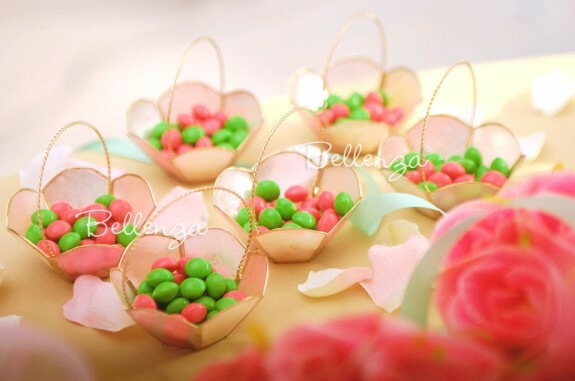 Here, a preppy-themed bridal shower uses these mini baskets as part of a pink-and-green favor display that mixes several kinds of favor packaging. 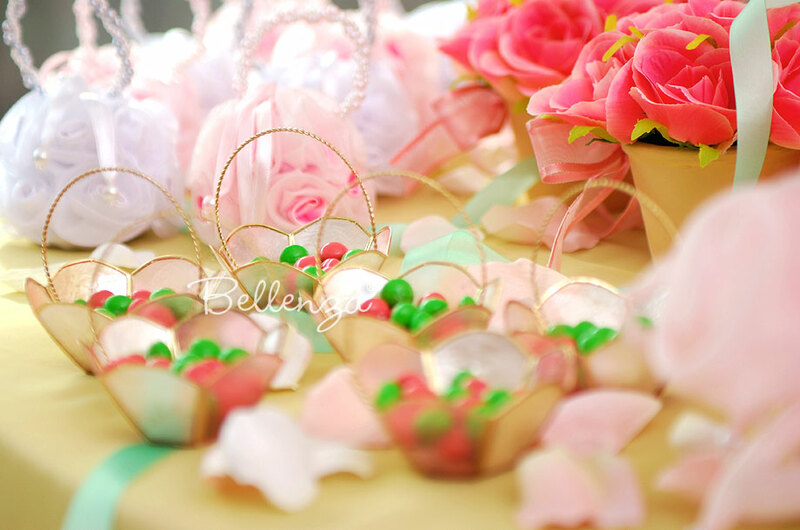 There are pomander bags, fabric flower pots, organza-wrapped goodies, and dainty tulle purses as well. Frilly and flouncy...but fun! 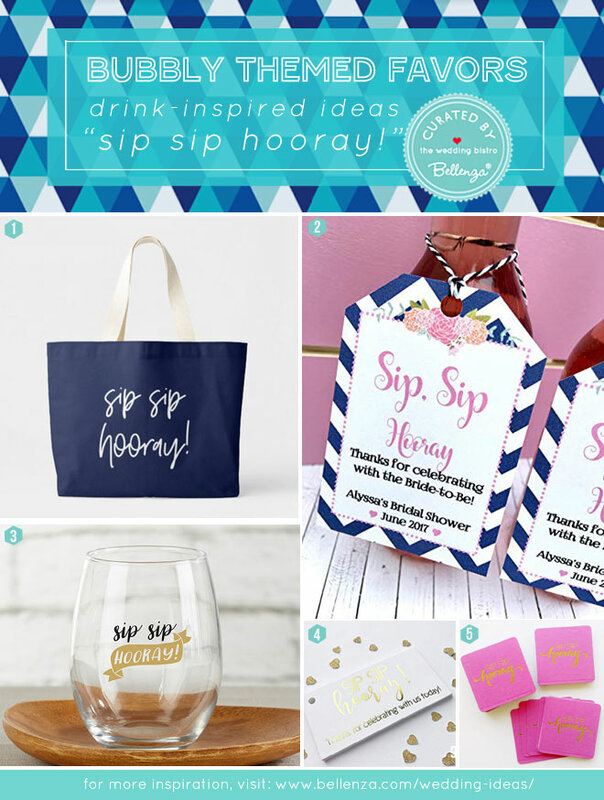 Add a little sass to a tea party-inspired bridal shower with a surprising dash of color. 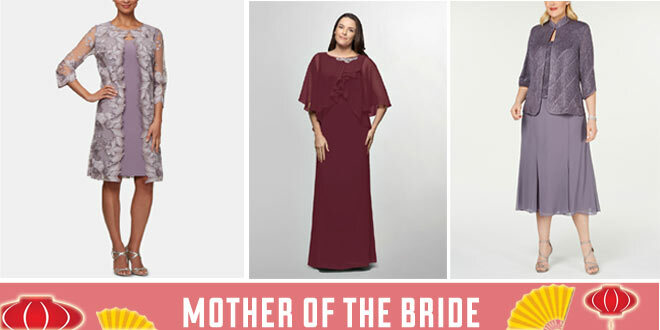 A striking pair would be hot pink and bright green. 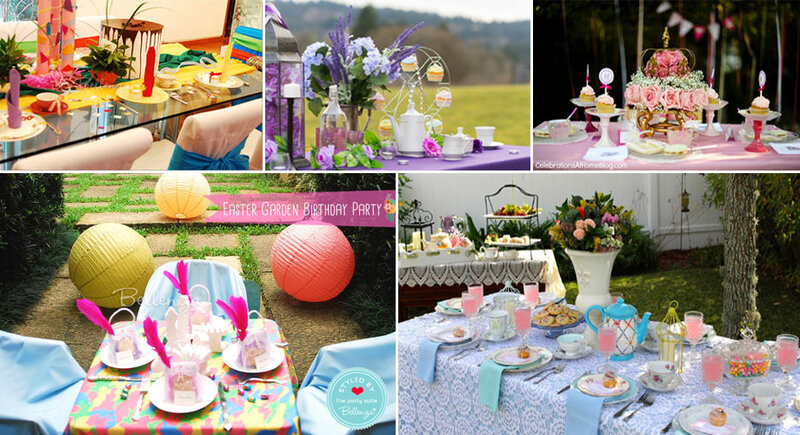 Here tiny treats in these colors add a playful look to the usually refined tea party scene. 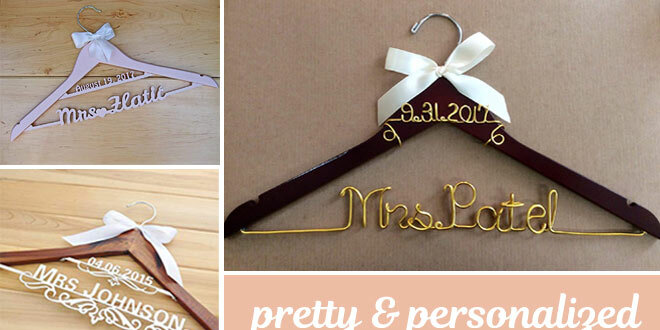 And for a fun finish, think swirling ribbons and scattered rose petals! 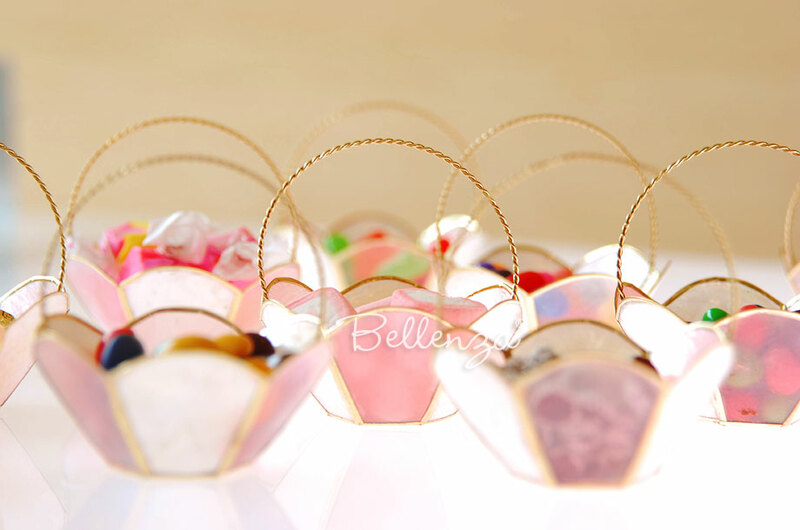 Each basket is enclosed in cello wrapping and packaged in its own box. 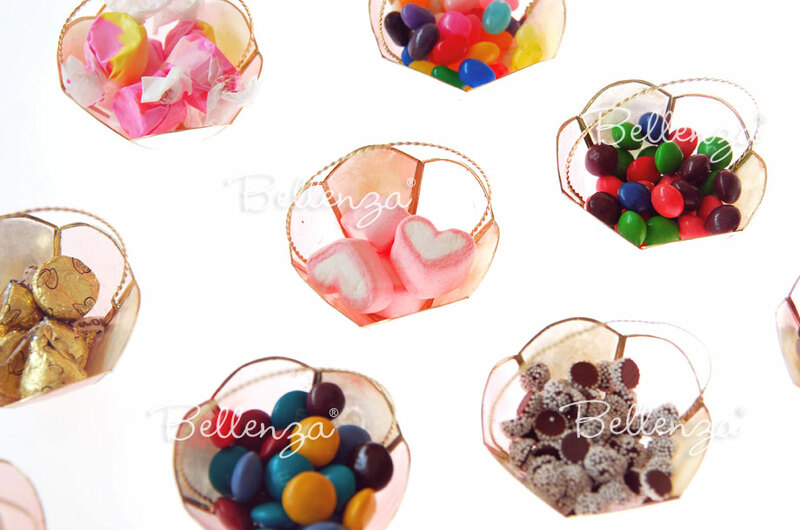 These baskets are ideal for presenting mini-sized cookies, candies, and chocolates as favors at a variety of themed events. 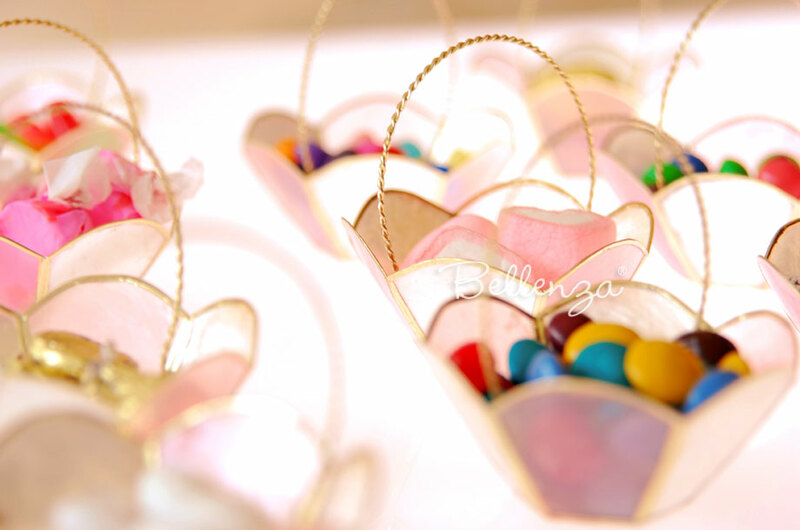 Their petite basket shape is perfect for spring or Easter celebrations, while the sweet colors would suit a bridal or baby shower, a Mother’s Day soiree, or even a Sweet 16 party. 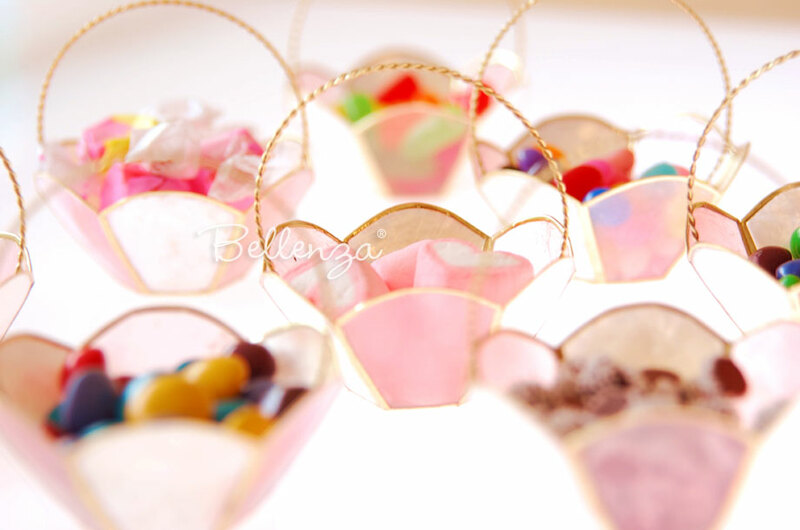 Our Soëbelle baskets are made of translucent capiz shells, originating from windowpane oysters. 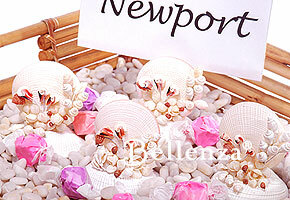 The shells undergo a special polishing and dyeing process resulting in a powder pink and pearl white finish. The scallop-edged design, gold-tone trimmings, and matching braided handle give these baskets their special charm. Oh, Sweet Baby! A Dessert Table for a Summer Baby Shower! 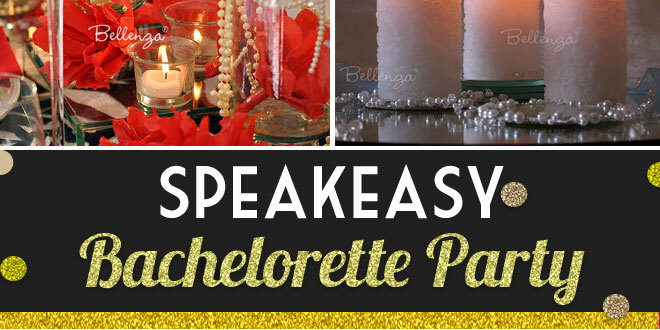 Styling Ideas for a Paris-themed Sweet 16 Soiree! 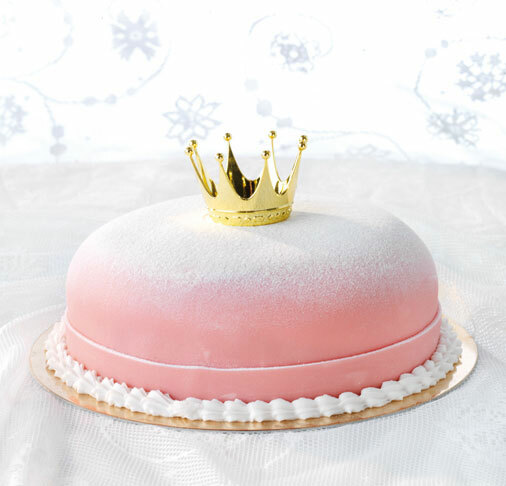 A Pink Princess Party Theme: Glam Details That Won’t Break Your Budget! 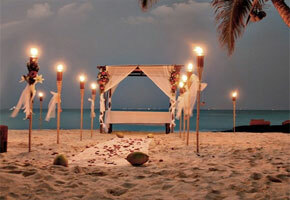 Creative Ways of Incorporating Lights at a Beach Wedding!